This week, we’re going to be looking at the limits of an employee’s duty to mitigate following a constructive dismissal through the 2012 case of Farwell v. Citair Inc.
For a quick refresher, check out our blogs from the archives on constructive dismissal and the duty to mitigate. Mr. Ken Farwell worked for Citair Inc., a manufacturing plant in Hensall Ontario. He started at the plant as a general labourer in 1971 and was promoted five times over the course of 38 years. His final promotion was in 2004 to the position of Vice President of Operations. 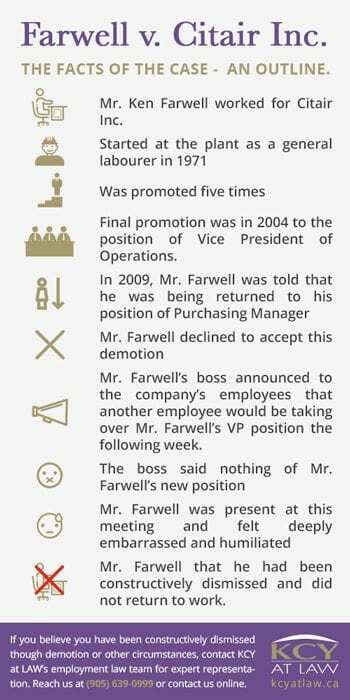 In 2009, Mr. Farwell was told that he was being returned to his position of Purchasing Manager, a position he hadn’t held since 1993. Mr. Farwell declined to accept this demotion. Nonetheless, a short time later, Mr. Farwell’s boss announced to the company’s employees that Mr. Wayne Meidinger, an employee Mr. Farwell had previously overseen, would be taking over Mr. Farwell’s VP position the following week. The boss said nothing of Mr. Farwell’s new position. Mr. Farwell was present at this meeting and felt deeply embarrassed and humiliated by this public announcement that a more junior employee would be taking over his position. Arguing that he had been constructively dismissed, he did not return to work. Had Mr. Farwell been constructively dismissed? If so, what was the reasonable period of notice? Did he mitigate his damages? Was he entitled to damages for mental distress? In court, Citair Inc. argued that, while Mr. Farwell’s job title had changed, his salary and work conditions were fundamentally the same and that he had therefore not been constructively dismissed. Citair Inc. also argued that, by not taking the position as Purchasing Manager during the notice period, Mr. Farwell had failed to mitigate his damages. At trial, the judge found that Mr. Farwell had been constructively dismissed. The judge agreed with Mr. Farwell that the move from his position as Vice President of Operations to Purchasing Manager involved a substantial change in duties, responsibilities and, importantly, demoted status and prestige in the company. Given Mr. Farber’s age (58 years), length of employment with Citair Inc. (38 years) and high managerial position, the judge determined 24 months to be an appropriate length of notice. Furthermore, the judge found that Mr. Farwell had not failed to mitigate his damages by refusing the position of Purchasing Manager during the notice period. Mr. Farwell found a position as a Purchasing Agent for Citair Inc.’s competitor, Northlander Industries, approximately seven months after his dismissal. The judge determined that Mr. Farwell had made reasonable efforts to find comparable employment in the difficult economy of the time. The judge found that Mr. Farwell was not obligated to take the position of Purchasing Manager during the period of working notice. Despite a similar salary and working conditions to his previous position, the judge noted that holding this position (which he had held years earlier) would have constituted working “in an atmosphere of hostility, embarrassment or humiliation” since he would be reporting to a previously subordinate employee. The judge, however, did not find that Mr. Farwell was entitled to damages for mental distress. 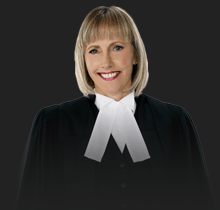 According to the Farber case, a demotion, especially one with diminished prestige and status, can constitute constructive dismissal. However, if Citair Inc. had asked Mr. Farwell to return to his VP position for the duration of the notice period, Mr. Farwell would have likely been required to do so. 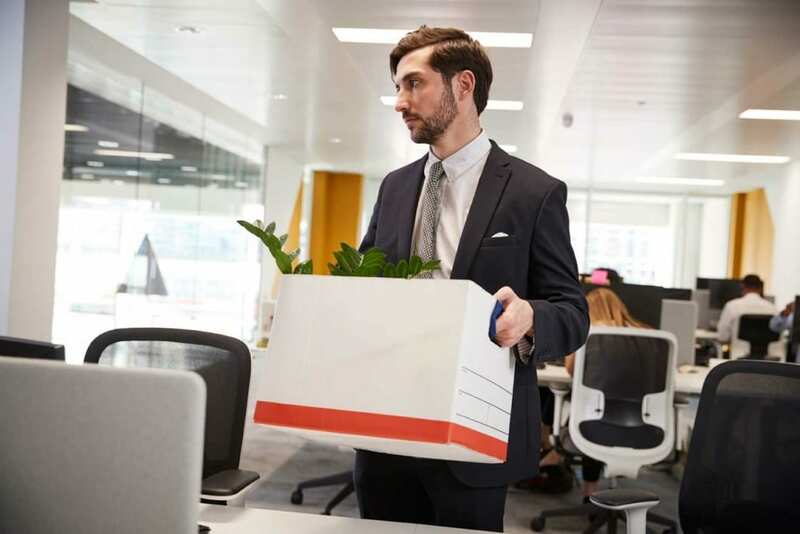 The Farwell v. Citair Inc. decision suggests that, in cases of constructive dismissal involving a substantial demotion, employees will not have to mitigate damages by working the notice period in the diminished role. 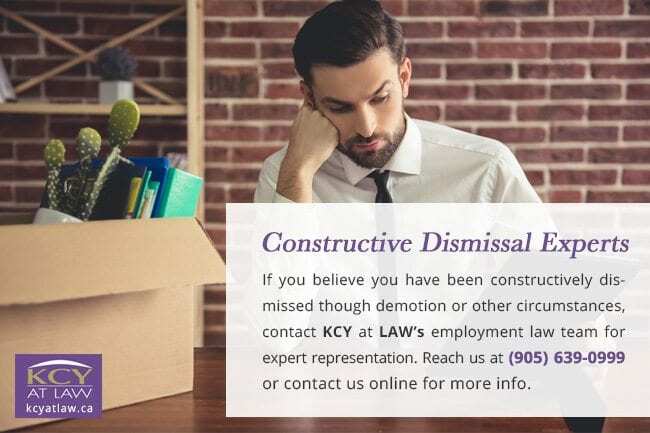 If you believe you have been constructively dismissed though demotion or other circumstances, contact KCY at LAW’s employment law team for expert representation. Reach us at (905) 639-0999 or contact us online.